Homemade multipurpose joinery jig for a table saw. Capable of being utilized to cut tenons, produce keyed miter joints, and cut spline slots. 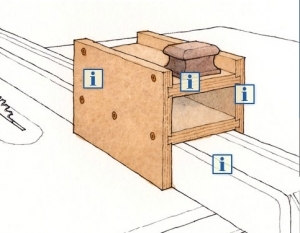 Features sliding dovetail construction. When I finish reading about a tool and I think to myself, "I'll be darned". That;s something. The initial picture doesn't do the builder's creativity justice. Nice.